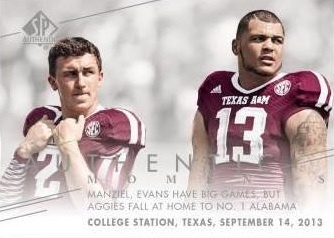 SP Authentic has established itself as one of the prominent names in the Upper Deck stable and the college football product continues with 2014 SP Authentic Football. Each hobby box yields three autographs and a variety of inserts and short prints. 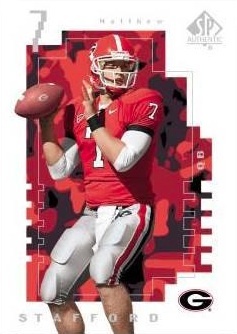 The 2014 SP Authentic Football Base set includes 100 cards. Adding to that, there are a total of 50 short prints, including 30 Rookie Short Prints (1:7 packs) and 20 Legends Short Prints (1:20 packs). 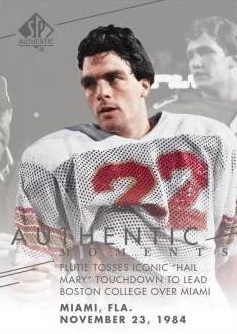 Authentic Moments highlight some of the biggest college football events and fall 1:4 packs. Autograph parallels are also available. Dropping one per box, Rookie Auto Patches complete the main set with 35 signed jersey cards, numbered to 550 or less. Inscription parallels are limited to ten or less. Multiple inserts fill out the product. Canvas Collection inserts average 1:5 packs. 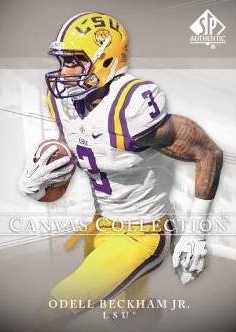 Canvas Collection short prints (1:45 packs) and autographs bring some rarity. 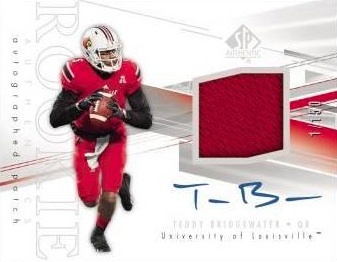 Numbered to 999, Future Watch inserts drop three per box and offer red parallels (#/99) and autographs (#/25 or less). A staple of SP Authentic products, various Sign of the Times Autographs complete the primary autograph options. Collectors can also find Super FX bonus packs, which average three per case. Each Super FX bonus pack includes one Super FX Autograph cards and two Super FX Rookie or Legend cards. Bonus content. Overall odds - 1:2,336 packs. Only found in Super FX Bonus Packs. Not a lot of Terrance West (actually playing well) but plenty of Robert Herron and Tajh Boyd? Seriously, to all the companies, collectors are tired of Tajh G-D Boyd coming out of boxes. No Clowney? (#1 pick) No Tre mason (best performing RB in the class this year)? Not even as a base card? Missing some serious stars here but chock full of guys not even on an NFL roster. Cards do look better than last year. Either you hate the auto odds or you don’t. I don’t agree that all the guys that you might want are super short printed while Robert Herron has an auto in every box made. So another product that you get junk. Continue to look back at Topps 2013 auto limit to 500 which was so good because you know that you had as good of chance to get a 1st rounder as a 7th. But why pay those over hyped 1st rounders big signing deals when you can throw peanuts at these bottom feeders and still fill your boxes?? GREED over QUALITY AND SERVICE FOR COLLECTORS. Becoming a real down year for the hobby quality of value. Broke two boxes this year and more than likely will stop for 2014. 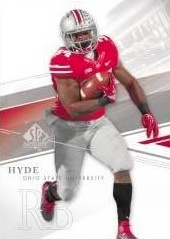 Way, way to many one color swatches coming out of this product same as SPA hockey last year. It is not like the swatches are game used or something! One of my autos was a practice squad guy, so basically worthless unless you were his momma. Much improved this year. I love the design. While it is tough to get a top tier auto, there are some great players that are readily available to pull. Love the design of the cards this year. And the checklist is much improved from the previous years. Add to that a base set that’s not too difficult to build, the classy looking RPA cards, and all autos are on-card makes this a must buy from me each and every year. Bought 3 boxes, and did well in each one. First box yielded me a Tom Savage auto, Tim Brown classic vet parallel auto, and a Terrance West #d to 10 Inscription tag RPA. 2nd box was even better. Second box yielded a Brandon Coleman auto, Bruce Ellington RPA and a Ben Roethlisberger canvas collection autograph card. And 3rd box was also chock full of nice hits, a Jeremy Gallon auto, a Raijon Neal Inscribed auto #d to 25, and a sweet looking Teddy Bridgewater RPA. I’m 3 for 3 on this product so far. SPA is a solid product. 2014 Upper Deck SP Authentic Football Hobby Box - Factory Sealed! 2014 Upper Deck SP Authentic SEALED Football 12 Hobby Box CASE, Garoppolo, Carr! 2014 SP Authentic Factory Sealed Football Hobby Box Jimmy Garoppolo AUTO ? ?